Learn more about Nandanik Dance Troupe’s dancers. Nandini Mandal is a renowned dancer, teacher of Bharatanatyam, an Indian classical dance form. She started learning Bharatanatyam under the guidance of her teacher, Guru Snigdha Pal, Kalamandalam Venkitt, Preetha Venkitt,India and completed her Senior Diploma in Bharsatanatyam. She specialized in Abhinaya or expressions under the legendary Guru Sonal Mansingh. She received the Artist Opportunity Grant in 2016 and completed a master workshop in Advanced Kathakali and Mohiniattam dance forms in India. Nandini helped Nandanik Dance Troupe conceptualize and present the first Indian classical dance festival and exhibition, Vilaya, in Pittsburgh in 2018 made possible by the Lift Grant of Greater Pittsburgh Arts Council. She has choreographed and performed at various cultural festivals in India and at different locations in the US. She is constantly expanding her creativity by collaborating with local artistes and performing in schools, colleges and at other public forums. Through the Nandanik Dance Troupe she has choreographed and directed dance dramas including Chitrangada - In Quest of Truth, Shyama - The Royal Courtesan, Raja - King of the Dark Chamber, Card Country, Prakriti- Matrika Mrittika, Ritusatram. She is constantly expanding her creativity by collaborating with local artistes like Mary Miller, Charles Hall, InterPlay and Africa Yetu, and with international dancers. She was the cultural ambassador of India with the World Affairs Council, UNO, Pittsburgh chapter in 2009 and 2012. Her philanthropic activities include fundraising through Dance for Cure events for the Leukemia Lymphoma Foundation, and American Cancer Society. In October 2018, Nandini and Nandanik Dance Troupe helped raise funds for flood ravaged state of Kerala, India through the event ASHA- Kerala Calling. As an art educator, Nandini presents interactive lecture demonstrations on Indian art and culture at numerous schools and colleges in Allegheny County, Washington County, including the YMCA, Western Pennsylvania School for the Blind, Point Park University, Penn State (Kensington and McKeesport campuses) Community College, Allegheny College, Duquesne University, Carnegie Mellon University. She has been a panelist at the All for All summit in 2017 and at the Responsibility Conference of GPAC. Her most rewarding event was to present a Bharatanatyam based musical on life of Christ before Mother Teresa in 1993. A leukemia survivor, Nandini is a dance activist, and works as freelance interpreter and translator. Sanjib Bhattacharya, recipient of India’s President’s Award from Dr.A.P.J Abdul Kalam in 2006 and Pratibha Patil in 2011, is an accomplished Manipuri Dance Exponent, Guru and well-known Choreographer of India and abroad. He has received his training under the tutelage of Guru Bipin Singh, Padmashri Darshana Jhaveri, Kalavati Devi, Manjushree Chaki Sircar and Mamata Shankar. He is currently an established performer of great repute having extensively performed across India and abroad. He is presently the resident teacher at the Rainey Institute of Cleveland, Ohio, and conducts master classes at Cleveland Art Museum. Sanjib is not only performing as a solo artist but has been performing with eminent Gurus and Icons of Indian Classical dances like Padmavibhushan Sonal Mansingh, Padmashri Darshana Jhaveri, Padmashri Ranjana Gauhar, Pratibha Prahlad, Vaijayanti Kashi, Gopika Verma, Sadanam Balakrishnan, Parwati Dutta and others all over India and abroad. Sanjib is conducting Lecture Demonstrations and workshops regularly in India, United Kingdom, Poland, Japan,Spain, Sri Lanka, Philippines, and the United States in Manipuri and Contemporary dance styles. Sanjib provides regular workshops at Nandanik Dance Troupe and has also co-choreographed several productions with artistic director Nandini Mandal. He played the protagonist in NDT’s Card Country and participated as a performer and panelist in Vilaya- International classical dance festival in 2018. Besides Nandanik Dance Troupe, Sanjib has performed at UCLA Asia Pacific cultural exchange programme,Manipuri dance vision Los Angeles, Sristi dance,Manipuri community NYC, Nritya Creations NJ, Navanritya Dance academy Philadelphia, Angakala Kathak academy Cleveland and Seattle, Kalabharati Montreal, Cleveland museum of arts, Duffy liturgical, Cleveland school of arts, Rainey institute, Bay area Creative dance academy, Bay area Prabashi, Bay area Natraj school of dance, Bay area gurukul and others. He is a resident artist and teacher at the Rainey Institute in Cleveland Ohio. Learn more about Sanjib's career! Harikishan Nair is the Artistic Director of Regatta Kala Kendra situated in Toronto. An accomplished dancer, Harikishan is trained in four different styles of Indian classical dance – Bharatanatyam, Kuchipudi, Kathakali and Mohiniyattam. Harikishan trained in Bharathanatyam under the tutelage of renowned Guru Girija Chandran. He learnt Kuchipudi under Guru Smt. Geetha Krishnakumar and Guru Smt. Bijula and was trained in Kathakali under Guru Sri Nelliyodu Appu Nampoothi. He has presented numerous performances till date and has worked with legends such as Dr. Padma Subramanyam, Sri. Madurai R Muralidharan, Dr. Menaka Thakka,Lata Pada ,Guru Kohinoor Sen Barat, Sri Janak Khendry, Smt. Uma Murali and so on. Harikishan has also performed for major dance Festivals in India, USA and Canada. His recent dance production “SAMYOGITA” was a showcase of three different South Indian Classical dance forms with a group of 20 established and emerging dancers. He was awarded the title “Natya Shiromani” for his contribution to dance. He has also won the title “Kalaprathibha” during his tender age for the youth festival competitions conducted in Kerala. Each performance for him is a tremendous learning experience, filling him with a sense of euphoria, as dance for him is a celebration of life itself. A male bharatanatyam performer , teacher , choreographer is a student of Shri Deepak Mazumdar ji and has taken his initial training from Kum. Vasantha. He is one of the most promising and established young generation artists of the country who practices Bharatanatyam - An Indian Classical Dance Style. Pavitra has also travelled extensively to perform solo and many production across the country and outside India. Pavitra also teaches this Art in Mumbai at his studio P.A.V.I. for promotion of Indian Classical Dance. Roosha Mandal has been training in Bharatanatyam for the past 14 years and Navanritya for the past 8 years at the Nandanik Dance Academy. As an assistant instructor from 8 years ago she has blossomed into a regular instructor teaching the junior levels for the last 6 years. In India, Roosha attended master classes in Kathakali and Mohiniattam as well as Bharatanatyam under Gurus Kalamandalam Venkitt and Preetha Venkitt of Calcutta. In addition, she has completed workshops under Guru Dr. Sonal Mansingh in Abhinaya (expressions), Sanjib Bhattacharya in Chhau and Manipuri, Guru Darshana Javeri in Manipuri, and Pavitra Bhat and Sucharita Sharma in Bharatanatyam. Roosha also underwent rigorous training in jazz-lyrical, modern, ballet and hip-hop dance at the Thomas Studio of Performing Arts and The Academy of Dance by Lori for several years and performed these dance forms in annual recitals. In 2012-13, she completed an intensive apprenticeship program at Kelly-Strayhorn Theater in contemporary dance with renowned travelling companies. Roosha has used her versatile dancing skills in the Confluence, collaborating with local dance organizations like MillerDance and Afrika Yetu. Over the years, Roosha travelled with Nandanik Dance Academy and Troupe to perform in different corners of the USA.She played key roles in the Nandanik dance productions such Prakriti, Card Country, Shyama, Chitrangada, Raja, and Tomari Matir Konya. She has performed in many international festivals - the Three-Rivers Regatta, Chinese Dragon Boat Festival, Western PA School for the Blind, Phipps Conservatory, Bayer International, Pittsburgh International Folk Festival, India Day, Bengali Association of Pittsburgh, and at numerous schools and colleges in the Greater Pittsburgh area through the World Affairs Council. She also taught Indian dance to children in a summer camp at the Thelma Lovett YMCA in Pittsburgh in 2015. Roosha is a Junior in the Sciences and Humanities Scholar program and a recipient of the Jack G. Buncher Memorial Presidential Scholarship at the Carnegie Mellon University, with an avid interest in poetry writing. Aparna Roli Nigam, is a classically trained dancer in Bharatanatyam. She has been studying dance under Guru Nandini Mandal since 1999. She also underwent classical dance training with Guru Sonal Mansingh, Guru Pavitra Bhat, Guru Sanjib Bhattacharya, Guru Kalamandalam Venkitt, Guru Sucharita Sharma, Guru Priyadarsini Govind, and Sukalyan Bhattacharya. 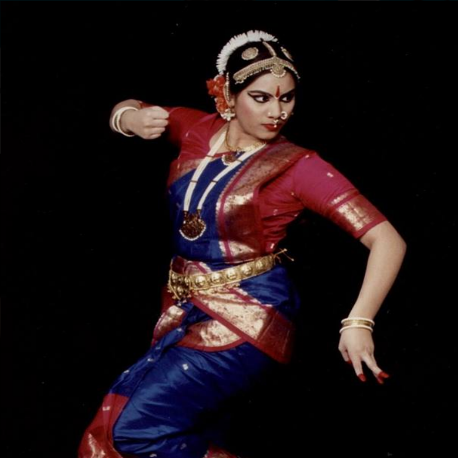 Aparna graduated from the College of Engineering at the University of Kentucky in Lexington where she was a member of the University's Dance Ensemble. During her time as a dancer and choreographer in Kentucky, Aparna produced a record number of pieces and went on to receive several awards for her exceptional choreography and outstanding contributions to dance. Since returning to Pittsburgh, Aparna has been an active member of the dance community having collaborated with Silk Screen, Modern Formations Art Gallery, Hakan Dance, Amethyst's Pittsburgh Belly Dance, and many more. Aparna has been a member of the non-profit organization Nandanik Dance Troupe since 2011 and served as President in 2014-15. As a lead dancer in several Nandanik productions, including Chitrangada, Card Country, and Prakriti, she has excelled in both the classical and contemporary dance forms. She has also choreographed and performed for Pittsburgh festivals such as Ugadi, Holi, Diwali, Three Rivers Regatta, International Folk Festival, Dragon Boat Festival, India Independence Day Celebration, and nationally in North Carolina, New Jersey, and Baltimore. For more than a decade, Aparna has been teaching the Bharatanatyam, Navanritya, and Loknritya styles of dance at the Academy. Aparna's countless hours of teaching, dancing, and choreography for Nandanik is testament to her selfless love and devotion for dance. In 2015, she received the 'Service and Excellence' award from the Academy for her outstanding contribution as an Instructor at Nandanik. Dr. Nandini Bhowmick started learning dance at the age of 12. She was trained under eminent Guru Kalamandalam Venkit and Acharya Anusuya Ghosh Banerjee. After competing for Rajya Sangeet Academy ( state level scholarship examination ) Nandini underwent advanced training with Padmabhusan Saroja Vaidyanathan and Rama Vaidyanathan. Nandini has performed at various festivals in New Delhi, Chennai and Kerala. One of them was the famous Soorya Festival of Kerala. Nandini is also trained under yoga and creative dance under Pandit Narendra Sharma, eminent disciple of Uday Shankar. Besides dancing Nandini was actively involved in television industry and social media. Nandini is delighted to be a part of Nandanik Dance Troupe!